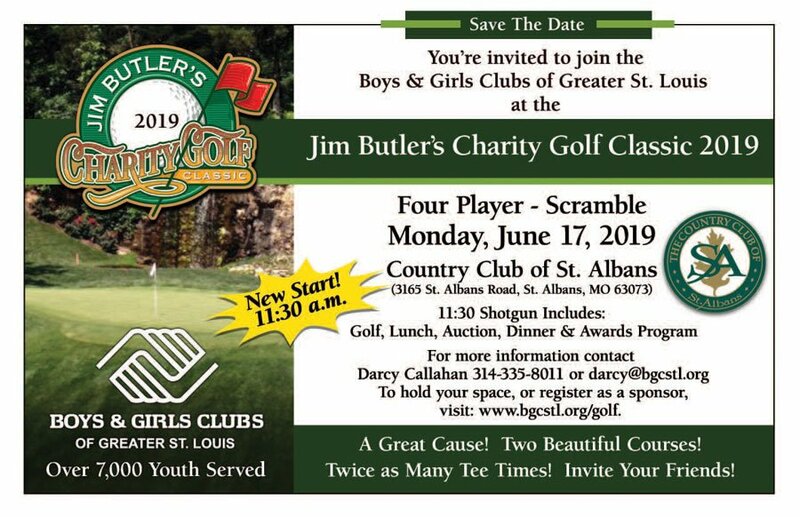 The 2019 Jim Butler’s Charity Golf Classic will be held June 17, 2019 – 11:30 am at The Country Club of St. Albans. A fun-filled tournament experience includes afternoon tee times, golf, lunch, live and silent auction, dinner and awards program. Both courses will be available for the tournament. One of the most anticipated Club events of the year, the tournament has helped increase awareness of the Boys & Girls Clubs of St. Louis and raise funds for its programs throughout the community. Proceeds from the golf tournament are designated to vital Health & Life Skills programs, which teach our kids how to live healthy and productive lives. The Club provides children with drug, alcohol and violence prevention programs, teen pregnancy prevention, fitness and recreation, aquatics, nutrition, and more. Club members also benefit from free on-site dental and vision care. Our proven youth development programs empower the kids we serve to make positive choices that will lead them to successful adulthood and civic engagement. For more information on how to get involved with future golf tournaments contact Darcy Callahan at 314-335-8011 or darcy@bgcstl.org. To register or sponsor, complete the form below.